The Optoma EP7150 is essentially an upgrade of the EP729 - being the ultraportable model in the company's range. While its weight is now slightly heavier, the 1.2kg chassis is still ultraportable and compact. The new casing is unique to Optoma, so you won't see it sported by other vendors. The look is austere with the silver and black case having a navigation bar and three function keys - Enter, Power and Menu. On the rear of the unit you'll find the basic inputs the mobile traveller needs, which consist of 15-pin D-sub, video, S-video and audio-in ports. The focus ring is quite tightly fitted into the chassis and while the zoom dial is prone to being knocked, this is a nicely designed unit. In use, we found it to be quite a loud machine, largely due to the fan needing to cool the 1600 ANSI lumens lamp. This makes the EP7150 less than perfect for small meeting rooms; however, with a throw-range of up to 12 metres, it can be used in most medium-sized meeting rooms with ease. While there is a good deal of heat generated, this is only to be expected from such a small and compact unit. One of the complaints levelled against its predecessor wasn't to do with the unit, but rather the carry case. While it was large enough to hold the projector, it wasn't big enough to hold the cables. This has now been addressed and the new case is more than up to the job. 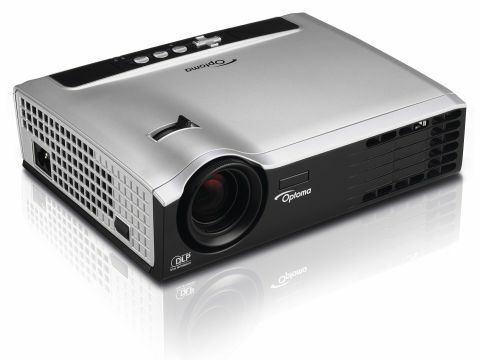 Despite its relatively high price, it's hard not to be impressed with the Optoma EP7150. Add to this an impressive specification for its weight, as well as an easy-to-use interface, and you have a winning formula.